Garrett JAG held a fundraiser at their first home football game selling balloons that would be let go on Garrett's first touchdown. The point of this fundraiser was to get the name of the JAG program out in the community for future students. Watch the video below for the release of the balloons. Everyone is Invited to join us at our I&I Ceremony. Will we recognize the members of our Career Association. There will speakers introducing the program to school officials and parents of students. Garrett's JAG class visited IVY Tech in Fort Wayne for the JAG 2015 Jag Fair. During this trip the students were able to explore all of the career angled programs that they had to offer. Then they enjoyed lunch and went to our final event of the day. The final event the students were all coraled into a room and put in front of a board of four colleges in the surrounding area. They were able to ask all of the questions they had about the colleges in general, then after the students were able to walk around and ask each college specifically and individually. Garrett's has created an action plan to end world hunger. The students plan on having a can drive with the school in there fourth block class. With what they collect they plan on donating the food to a national organization to send overseas. 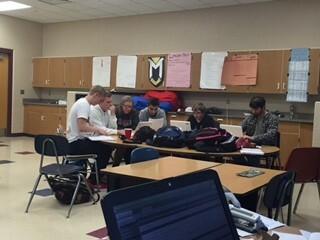 These students are working on the JAG commercial for CDC.